With Valentine’s Day around the corner, there’s a lot of sweet-talking going down, so I thought I’d share the love. When it comes to sweets, I tend to go for something lemony, so I asked my readers to broaden my horizons and speak to me of chocolate desserts. They were happy to report exactly what they love and why they love it. So, here’s a little gift from me to you: a list of some of my favorites, some of theirs and a couple of Valentine’s Day specialties you might want to kiss up to. Did we miss your heart’s desire? Do tell! One reader insists that after a side-by-side tasting of chocolate cakes — involving 22 invited guests and cakes from some of Seattle’s top bakeries –“Nothing came close to Bakery Nouveau’s exceptional quality and flavor.” Their classic chocolate cake is “a perfect balance of chocolate cake and ganache — both bittersweet. Not overly sweet, just rich and buttery.” A rousing vote for the West Seattle contender. My nod goes to the chocolate truffle cake at Simply Desserts in Fremont. Those luscious layers also hit that just-right note between sweet and not-so. I’ve been indulging for more than 20 years, and warn you: share a slice. Readers weighed in heavily for the shop’s chocolate fudge cake. No, wait, the chocolate caramel cake! — with a chocolate espresso cookie on the side. At Macrina Bakery Cafe, Olivia’s chocolate chip cookies are a must, I’m told: Pick one up in Belltown, Queen Anne or Sodo. I regularly get my cookie fix at Delancey in Ballard. What’s the secret to the success of the pizzeria’s bittersweet chocolate chip cookies? I thought it was the grey salt sprinkle, but have since learned it’s the time spent allowing the cookie dough to rest for days before baking it. For whom the bell (doesn’t) Toll: Molly’s bittersweet chocolate chip cookie with grey salt, at Delancey. There’s no baking involved in that marvel of mascarpone, tiramisu. And the tiramisu-for-two at Tutta Bella Neapolitan pizzerias (in Columbia City, Fremont, Westlake and Issaquah) — spiked with Frangelico and showered with chocolate shavings — is as good as it gets. Tiramisu for two at Tutta Bella. At Serious Pie, downtown and on Westlake, it’s the sea-salted chocolate budino that has folks talking. That pedigreed pudding is kiddie comfort-food kicked up for grown-ups, and the same can be said for France’s chocolate pot de creme — a dessert that always gets my attention when I’m in the Market for something sweet at Place Pigalle. 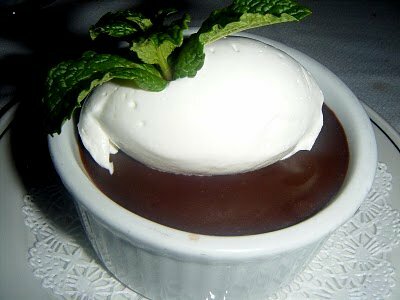 Color me addicted: the Belgian chocolate pot de creme at Place Pigalle. “Forget about fluffy egg whites, mascarpone cheese and those other ‘dairy don’ts!’.” say my vegan readers. 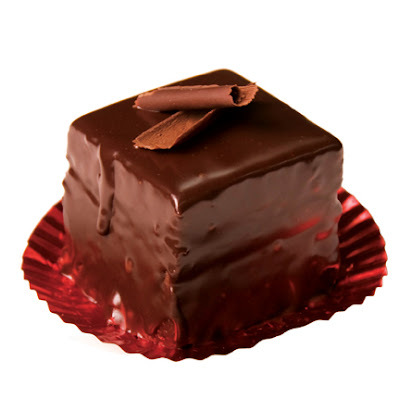 At Cafe Flora in Madison Valley, the four-layer nibby gianduja torte is the way to go. Unless you’re in Wallingford, where Sutra’s vegan prix-fixe often includes something chocolate-y. If you’re lucky, it’ll be the rose chocolate mousse torte with pistachio crust one reader raved about. The February issue of Bon Appetit magazine profiles Seattle pastry-chef Neil Robertson’s ultra brownie with peanut butter ice cream at Westlake’s Mistral Kitchen. You might head to West Seattle to try the gooey Guinness brownie at the Irish pub Celtic Swell. It gets its Celtic kick from Guinness ice cream, custom made by Snoqualmie Gourmet. Drink up! At The Pink Door in Pike Place Market, the “X Rated Cocoa” is sexed up with Callebaut Belgian chocolate, peppermint schnapps and a homemade pink-peppermint marshmallow. 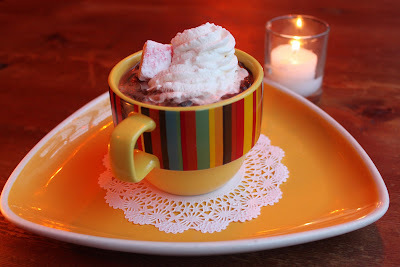 And on Capitol Hill, Cafe Presse concocts a memorable chocolat chaud — a cloud of thick hot chocolate. One advocate explained, “You spoon the chocolate like it’s soup, then dip it in the whipped cream” served on the side. May I advocate for lily-gilding? Have this for breakfast, with Presse’s pain au chocolat a l’ancienne: bittersweet chocolate melted over baguette. The Deathcake Royale from Cupcake Royale may be short-lived, but it’s back — till Feb. 14 (in Bellevue, Ballard, Madrona, Capitol Hill and West Seattle). Advertised as a “deadly dark indulgence,” its Northwest ingredients include Theo Chocolate and Stumptown espresso ganache. Cost? $6.66. And yes, the devil made them do it. It’s ba-aack! — but only until Valentine’s Day: Deathcake Royale. El diablo is also responsible for what a fleet of readers call the most sinful dessert of all: Tango’s El Diablo. That Pike Street perennial, packing a hit of cayenne, is a mousse-like cake disguised as a giant truffle on a soft-meringue throne. Add tequila-laced caramel sauce and Marcona almonds, and like that Deathcake, it’s killer.